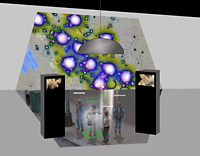 Following completion of Playing the Rapture in 2008, I created two different video installations for a pair of 2009 exhibitions, "Mediated" at the California Museum of Photography, and "Scalable Relations: Playing the World(s)" at UC San Diego's Gallery@CalIT2. Details on both installations are below. 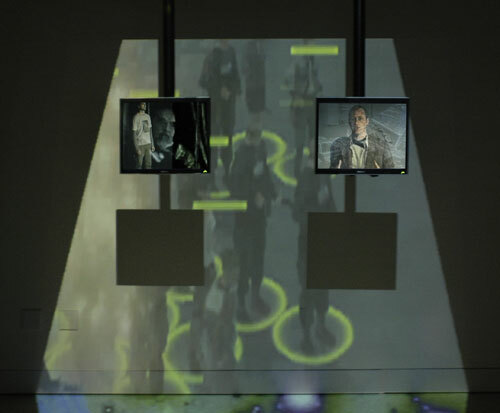 For this show, curated by Whitney Museum adjunct curator Christiane Paul, I created Playing the Rapture (Point of View), an installation in which the performance video was reedited so that imagery of each of the two protagonists was channeled to its own video monitor. These were suspended about 6 feet off the floor, creating a surrogate 'body' for each performer. Edited video of the machinima projections, scaled down and projected on wall and floor, replicated the original performance environment. Although the video was split between two monitors, the sound was channeled intact through a sound dome hanging midway between the two monitors at a reasonable viewing distance. 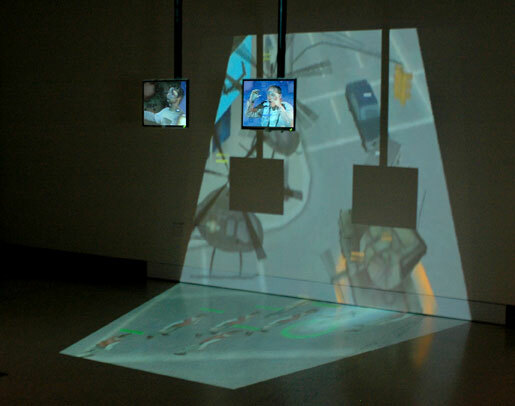 In this installation, entitled Playing the Rapture: Tiny, edited video of the original performance was projected onto a scale model of the original set. 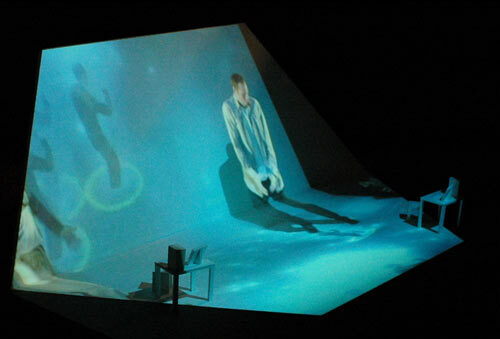 This 'reperformance' merged the performers with their projection environment, while simultaneously mapping them onto the miniaturized architecture of computer consoles. 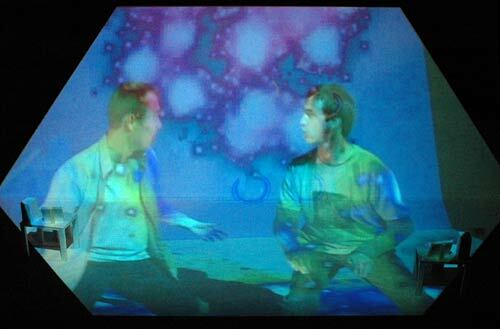 A consequence of the projection onto a shaped surface was an anamorphism that both enlarged and distorted the performers' bodies. At different viewing angles, the illusion of a coherent virtual space came and went.